The New York Times had a nice article about trilobites the other day, accompanied by a chart illustrating a number of species. 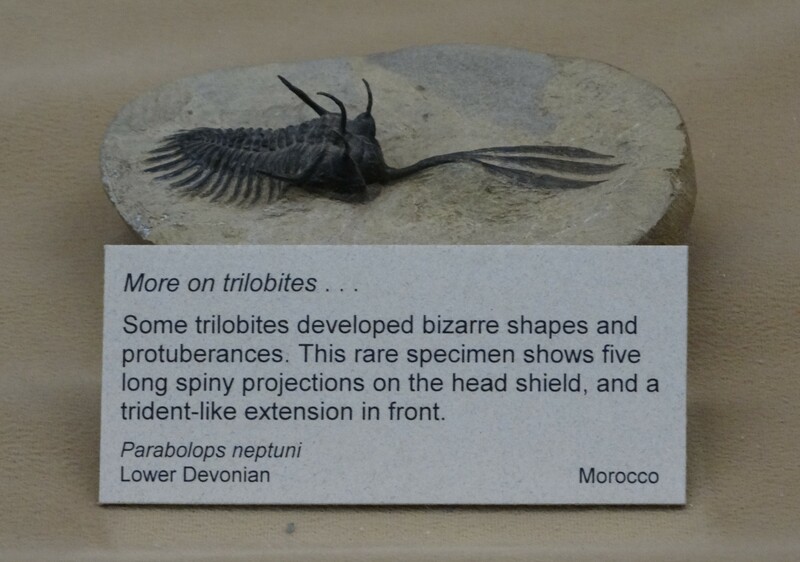 It got me thinking about the trilobites I saw in fall 2013 on my quick tour of museums in the American west. Not all the small museums include trilobites in their displays, as they often focused on local finds, but two had what I thought were the same species. On looking at the photos recently, even my unpracticed eye could see that there were subtle differences that became less subtle the more I looked at them. One was from the Mesalands Dinosaur Museum in Tucumcari, New Mexico, the other from the Wyoming Dinosaur Center, in Thermopolis. Both fossils are originally from Morocco. The Mesalands specimen is from the Lower Devonian, thus older than the one in Wyoming, which is from the Middle Devonian. In my memory, they were the same, because I was picturing the graceful trident-shaped prong at the front. It’s a little hard to see here, as the photos are from different angles, but it looks as if the Wyoming specimen has spines along a crest on its back and a row of legs (I think that’s what they are) around the edges. It looks more formidable than the Mesalands specimen, with its neat little skirt of legs frilled around the sides and back. They are exquisite, both in themselves and in the delicate lab preparation. Posted in Blog, ScienceTagged Devonian, Mesalands, Thermopolis, Thermopolis WY, trilobite, Tucumcari, Wyoming Dinosaur CenterBookmark the permalink.